Downtown Navasota is a mixed-use community center. Residents visit the area often to take advantage of the shopping, entertainment, and business destinations available. Land uses include government facilities such as City Hall, the Police Station, the Public Works Building, Grimes County Chamber of Commerce, and the United States Postal Office. Many service agencies operating in support of local and county government also maintain offices in Downtown. Privately funded investment includes administrative and customer service facilities for several local and regional banks, businesses engaged in real estate, and other private business services. Several restaurants, live performance and cinema venues, and a wide variety of shopping can also be found within Downtown. Other attractions include several churches, an art facility providing training and sales space, a custom woodworking shop, and several automotive service centers. 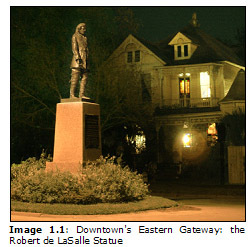 Historic structures can be found throughout Downtown, as well as in the Old Town neighborhood to the east and south. Together, this neighborhood and Downtown include historic homes, churches, and commercial structures which are recognized at federal, state, and local levels. Residential opportunities also exist within Downtown and the surrounding neighborhoods including traditional single-family homes, multifamily developments, and mixed-use housing in the form of loft apartments (see Image 1.3). Two major state highways intersect within Downtown. State Highway 105 (Washington Avenue) runs east-west and serves as the de facto "Main Street," and State Highway 6 (LaSalle Street) provides the principal north-south route through the City. Several railroads also cross Downtown bringing both economic benefit and transportation/safety concerns. Through its nature as a communitywide destination, Downtown Navasota functions as the only neighborhood shared by the entire City. Pedestrians and drivers are courteous and friendly, with spontaneous conversations and meetings common. Downtown has been in near constant use since the founding of Navasota. Unlike downtowns in some cities of similar size, Downtown Navasota has retained much of its commercial, cultural, and governmental influence, and remains a true Central Business District (CBD). While Downtown has enjoyed a favorable position within the community, regular activity has caused a strain on the built environment. City improvements and private investment have successfully maintained an acceptable level of service, however, some care may be needed to improve the quality of life within Downtown. Street lighting for example is provided in a variety of formats. 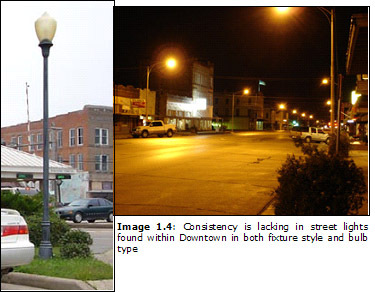 Several sites such as the Bank of Navasota, Security Square, and the Cedar Creek Park area have been equipped with antique style street lighting; while in other areas contemporary "cobra head" street lighting is used (see Image 1.4). A consistent and pedestrian oriented streetlight design would be helpful in promoting the vitality, safety, and aesthetics of Downtown. 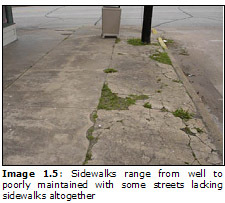 The design and maintenance of sidewalks is another area of concern when addressing urban design (see Image 1.5). Some portions of Downtown, such as western Washington Avenue and Farquhar Street have relatively wide sidewalks. However, some side streets and areas lack sidewalks altogether. Wheelchair ramps, street furniture, and vegetation are also provided in a somewhat arbitrary manner, plentiful in some areas while lacking in others. Where found, these amenities greatly enhance the overall experience within Downtown Navasota; however more consistency in their location and design would serve to improve the overall urban setting. In the past 50 years Downtown has not experienced major redevelopment. Several structures were removed due to development pressure, fire, or general structure aging. 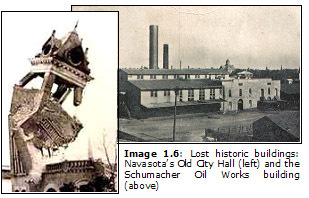 Several examples include the Old City Hall and Schumacher Oil Works, with some recent construction of new buildings (see Image 1.6). Structures built in their place remain true to Downtown's historic form in terms of setbacks and façade style. However, they represent a more suburban development trend as they are single-story/single-use structures. 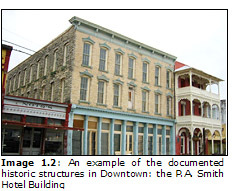 In order to retain the unique and valuable character of Downtown, redevelopment should proceed with appropriate attention to the traditional built form. In most cases, such redevelopment would include multi-story structures providing the potential for mixed uses. Historic preservation efforts should also be considered as a means to distinguish Downtown from its principal economic competition, suburban style strip commercial development found elsewhere in Navasota and the region. Existing structures within Downtown account for just over five million square feet of floor space. 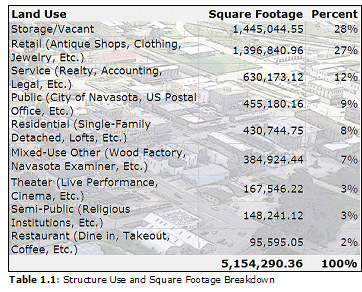 The top three structure uses observed are retail, service, and storage/vacant. Together, these uses make up 67% of the land use within Downtown. 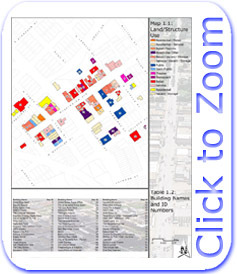 Map 1.1 displays the location and name of each building within Downtown while Table 1.1 shows a complete breakdown of the land uses within the district. 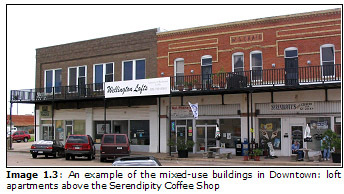 As recommended in both the 2004 Navasota Comprehensive Plan and 2004 Navasota Economic Development Plan the Downtown area should seek to diversify its land use types and utilize vacant buildings to their maximum potential. These changes might include additional offerings in entertainment such as open-air or roof-top cafes, up-scale nightclubs, or expanded theater operations (see Image 1.7). Both plans also call for a larger mix of residential offerings in upper floors such as traditionally designed loft apartments or bed and breakfasts. Existing artisan activities such as The Wood Factory are also identified as activities which should be encouraged and diversified in the Downtown area. Regardless of what specific land and structure uses are developed, the impact of this development on parking should be monitored. Many of the land uses suggested in these plans will require a higher number of parking spaces per square foot of development than is currently needed in Downtown. 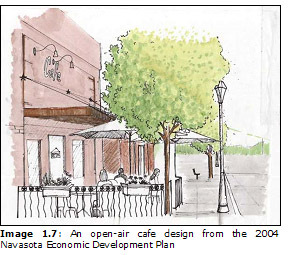 In terms of land, the Downtown Navasota study area encompasses roughly 18.75 acres of land. This acreage estimate excludes right-of-way for streets and railroads as well as water bodies. Of this land, 13.43 acres (72%) is currently occupied by permanent structures. Existing land use statistics utilized for this study are a compilation of data collected through fieldwork for the 2004 Navasota Comprehensive Plan with some minor changes to account for lease changes which have occurred since that document was published. All land use classifications are based entirely upon windshield surveys and should be utilized with appropriate caution. A full explanation of these limitations as well as complete data sets can be found in the Methodology Section (Section 7, Page 85). Downtown Navasota has historically relied heavily upon on-street parking and pedestrian traffic. This relationship remains the case, however, many parking lots are also found in the rear of buildings. There are approximately 500 striped parking spaces, with over half designed as on-street parking. 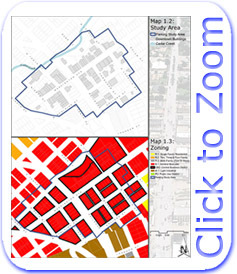 The study area (see Map 1.2) for this document roughly conforms to the "CBD: Central Business District" zoning classification found in Navasota's current Zoning Ordinance (see Map 1.3). Nolan Street serves as the eastern boundary of the study area, Holland Street the southern boundary including some development fronting on the south side of the street, Eighth Street represents the western boundary, and Cedar Creek and the development on the northern side of Fanthorp Street form the approximate northern boundary. Some areas immediately adjacent to the study area may be developed in a manner similar to existing Downtown structures as redevelopment proceeds. This land may include some parcels fronting along Cedar Creek, to the south of Holland Street, and to the north of Fanthorp Street. Future updates to this study should consider including these areas if development styles warrant.